Investing Between the Lines introduces a revolutionary method for evaluating the financial integrity of a company. You don’t need special access to “insider” information or a degree in accounting to figure it out. In fact, the secret is right in front of you—in black and white—in the words of every shareholder letter, annual report, and corporate correspondence you receive. Too often, corporate executives and investment professionals are expected to deliver short-term results. As a result, they are compelled to turn to accounting techniques and unclear language to meet these expectations. In Investing Between the Lines, L.J. Rittenhouse lays out her time-tested approach for recognizing at-risk businesses before trouble hits. This is the same method she used to predict the collapse of Enron and the fall of Lehman. From comparing the statements of Ford, GM, and Toyota to revealing why FedEx and Wells Fargo have been so successful, Investing Between the Lines shows that Rittenhouse’s system is one of the most powerful tools a corporate leader or investor can have. 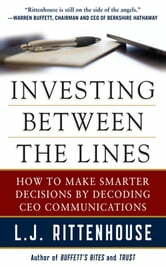 Once you learn the clues to decode CEO communications, you will be able to invest between the lines—to figure out exactly what a company’s CEO is or isn’t telling you. 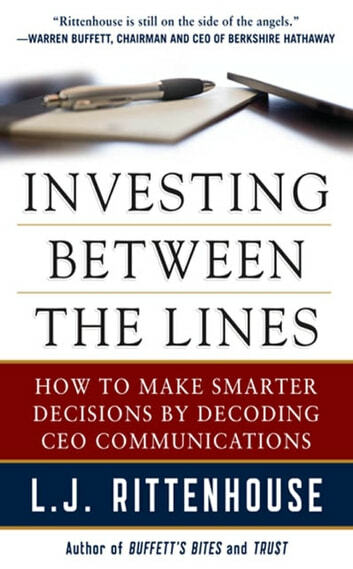 Whether you’re a professional investor, a new shareholder, or a CEO who wants to improve how your company communicates, Investing Between the Lines is one of the best investments you’ll ever make.